We all face challenges in life. But dwelling on them does us no good. These attractive return address labels are a reminder to keep pressing on. You can wait around wondering about what direction you should take, or you can get out there and face things head on. Do you want to be overly cautious or adventurous? It's your choice! Stick these self-adhesive labels on all your outgoing mail for a fantastic finishing touch that also makes a tedious task extra easy. A self-adhesive backing eliminates the need to scribble out your name and address on every envelope. That means you'll have a little more time to focus on the important things in life. 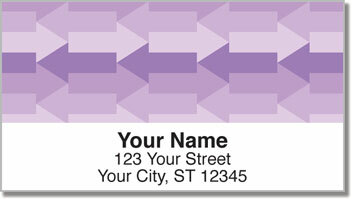 Make Purple Arrow Address Labels yours right now! We also offer several other shades in this same design. Plus, don't forget about matching personal checks!